A major celebration is planned. One that would far out rival the Queen’s Jubilee or the opening ceremony of the Olympics. This celebration is for the dedication of the wall of Jerusalem. The people of Jerusalem had gathered to sing to, worship, and praise God. Despite their committment to God and glorious celebration to Him near the end of the book we find that many of the Israelites had reverted back to their old ways. They had allowed the pagan foreigners to inhabit space in the temple and influenced their marriages and families. We find children not even able to speak their native tongue. The language The Law was told in. Nehemiah returns angry and furious at what has become of the city. He clears the city of the unholy practices and people and redirects the Jews back to following God’s law and the importance of passing on His word to the next generation. Nehemiah, like in all the previous circumstances finds himself in prayer before, after, and during addressing the Jews. In fact the book of Nehemiah ends in prayer. The above concludes the last chapters of Nehemiah. 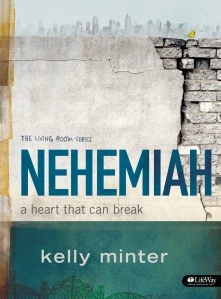 This week we conclude our study of Nehemiah and Kelly Minter’s book Nehemiah: A Heart That Can Break. Reading about the dedication of the wall was one of my favorite parts of Nehemiah. I can’t help but to picture the people singing Newsboys’ song He reigns. Mainly I picture this song because every time I hear it it seems to give me a glimpse of heaven. Jerusalem is also a foreshadowing of heaven. The wall was built to protect the city that protected the temple that was the dwelling place of God. Rebuilding the wall was indeed reason for a celebration. Like the Jews, someday as Christians we will live in a city protected by walls, with gates that will be impenetrable in the new Jerusalem where God will dwell eternally. Remember us with favor, O our God Nehemiah 13: 31. Today’s post is short because instead of taking up your time with words I would much rather you catch a glimpse of heaven. Watch the music video above. If you don’t have four minutes and some change to spare at least skip to minute 2:52. That is my favorite part of the song. Thanks so much for joining me on this journey of studying Nehemiah! I have really enjoyed it. Many times been challenged and strengthened by God. The greatest take away for me from this entire study has been to let prayer be my first response. Bathe everything in prayer. The more I pray the more I find my heart braking for those around me. What has been your greatest take away from this study? Do you have a particular song that to you is a glimpse of heaven? If so I would love to know what it is. This entry was posted in Transformed Deeper and tagged Bible Study, He Reigns, Kelly Minter, Nehemiah, Newboys on 08/10/2012 by Krystle. Even if you’re not following along in the Nehemiah study I encourage you to read this post. I am sharing what new plans are in store for me for the next couple of months. The Israelites gathered together for a worship service. Unlike the comfortable seats, air conditioning, and wrap it up in an hour culture of our day they stood for the entire reading of the Law followed by corporate prayer… outside… the entire morning. During this time together they remembered and praised God for what He had done through the Jews in the past and then made a covenant with God to “walk in God’s Law” (Nehemiah 10:29). They also promised God to give him the first fruits of everything that was theirs. Above is a very concise summary of Nehemiah chapters 9-10 which we covered this week in Kelly Minter’s Nehemiah: A Heart That Can Break study. I’ve struggled with what to write for this week. What did God want me to take away from it. I feel like every week I just want say, “Let prayer be your first response“. And while that is true and something I have been reminding myself lately there is so much more to take away from this scripture. I love it when I am able to look back at my life and see how God was working through bits and pieces here and there but at the same time weaving it all together. For instance one of my favorites in my life is how God provided work outside the home for me up until Noah arrived. As I was preparing to graduate college Michael Luke was still waiting to find out which physical therapy school he would be attending. This meant we had no clue which city for me to focus on for job applications or if we would even end up in the same city. At first it looked bleak because I went to interview after interview all over the place; Memphis, Atlanta, Birmingham, and Chicago. One trip to Chicago in the frigid Spring and I knew that place wasn’t for me. Anyway time moved on I still didn’t have an offer. Finally we found out ML was accepted to PT school at UAB in Birmingham. With a city nailed down I started focusing my applications on Birmingham. I interned close to home for the Summer and then out of the blue (according to God’s plan) found an architecture firm that was hiring… and wanted to interview me! The interview went well and I really felt like “they were the ones” when I left. A few days later I got a call offering me a job. A job as in interior designer with an architecture firm that specialized in healthcare. Healthcare was where I felt like God had been leading me my last semester in college so I was thrilled to get the opportunity to try my hand at healthcare design. The job wasn’t a piece cake. In fact it was harder than I could have ever imagined but I stuck with it and finally felt like I knew what I was doing. Isn’t that a good feeling to have. Anyway a little thing called the “Great Recession” hit. ML was still in school at this point so we didn’t know any different. Except for the fact that architecture firms were laying off people left and right and many just closed their doors completely. Being the only bread winner in the family at that time I tried not to stress and instead trust that God was in control and that He would provide. And provide He did. Our firm survived the recession and never had to lay off anyone. I’ll admit there were days where we all just sat around wondering who would be the first let go because there was no work but we made it! That in itself is a praise! Slowly work started to pick up again and everything returned to somewhat normal. We paid off ML’s student loans and started preparing for a little one. The news of my pregnancy was shocking to most at the office. Mainly because I had never shared that I didn’t plan to come back to work if we ever had children. That’s not exactly a good thing to advertise if you are ever in the middle of a recession. So I promised to work up until Noah was born and then in a sense put my career on hold until our children are older… or possibly never return. Work until Noah was born was exactly what I did. Right until and past when my water broke. I left that day knowing it was my last. ML and I felt peace knowing this and have been very thankful that He provided me the opportunity to stay home and invest in our little girl. So, that sounds like a good ending, right? Girl needs job. Girl gets job. Girl keeps job. I thought it was the ending too, but it’s not. You know how God is. He sees the bigger picture and comes up with things we would never dream. Like for instance, the opportunity for me to work part time from home as an interior design consultant. I mean who would have thought? Not me. I especially never would have dreamed that I would get a call out of nowhere one day offering me this job. Besides a few meetings here and there it won’t interrupt my schedule with Noah. I will be able to do everything for the most part during her naps and at night time. I’m a little nervous about diving back into the healthcare world but I really have a passion for it and trust that God will provide. I’m amazed at everything He has done and would have never dreamed this is what He had in store for me. And if it doesn’t work out this initial project will only last around five months and then things can go back to normal. This is just one example of God’s work and provision in my life. There are many others but I am always amazed at this one and continue to praise Him for it. Looking back at the past is exactly what the Israelites did with their prayer. They hit every high point and low point of their history and praised God for his continued leadership and mercy despite all their faults. My story isn’t without faults. There were plenty of days when I felt helpless and frantic and instead of turning to God in prayer I quickly mailed out resumes to whoever and whatever… hoping for an interview. I stressed more times than I should have during the recession. Job or no job God would have been in control. Despite all my many failures and faults along the way God continues to show His mercy and continues to unfold His plans for me. Do you ever take time to look back at your life and see God at work through it? Looking back is it easier to see how He has weaved everything together? Have you taken time lately to “confess” your praise to God? To confess how great and marvelous He is. 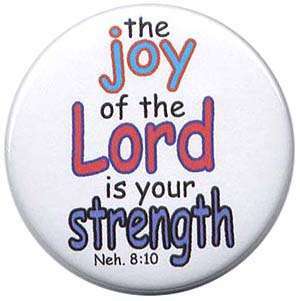 This entry was posted in Transformed Deeper and tagged Bible Study, Kelly Minter, Nehemiah on 08/02/2012 by Krystle.